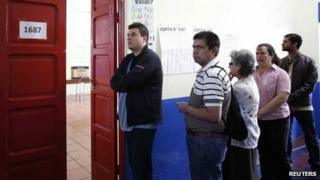 The governing party's candidate has taken a clear lead in early results as votes are counted in Costa Rica's presidential election. Johnny Araya of the National Liberation Party is on 36% with centrist Luis Guillermo Solis on 21% and left-winger Jose Maria Villalta on 17%. If no candidate wins outright, there will be a run-off on 6 April. Mr Araya has promised too distance himself from the scandal-hit government of President Laura Chinchilla. He has served as mayor of the capital San Jose for 20 years and ran on a pledge to reduce poverty. Correspondents say polling stations were empty in the morning but the turn out picked up in the afternoon. No disruptions have been reported. Mr Villalta was the only one of the main candidates not to attend a Sunday Mass. "I don't usually go to church. It would be hypocritical of me to go now, just because we are holding elections," Mr Villalta told reporters. His opponents accuse him of being a "communist" and planning to legalise abortion. Another leading contender, right-wing candidate Otto Guevara, promised to rebuild the "social fabric" and lower electricity prices. But with unemployment rising and the government involved in a string of corruption allegations, the president saw her popularity fade. Correspondents say her successor will have to tackle not only the country's economic woes but a deeply divided Congress.